We got a request to post about antioxidants, if they are healthy at all or if it's only a clever marketing scheme, as there are a lot of products out there boasting their antioxidant tendencies. Now, as I've been doing some research, it turns out this is no easy nut to crack. There is a lot of information out there on this subject, and it is quite complicated, at least for me who's never been that into chemistry and biology. The antioxidants work on a cellular level, which means there's a lot of talk about molecules and other similar things. I will try to simplify what I've learned so that maybe you guys will not have such a hard time. Apparently, our cells can be damaged or killed by chain reactions caused by free radicals, which in turn are caused by oxidation of a molecule. Oxidative stress can apparently help cause quite a few diseases, Alzheimer's to name just one. 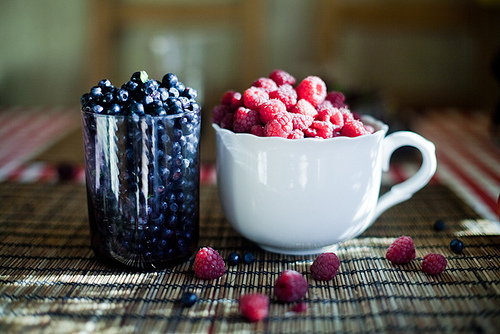 Antioxidants work to terminate the free radicals, and inhibit other oxidation reactions. So to make this extremely simple, the antioxidants kill the free radicals, which cause cell damage which in turn can cause a large number of diseases. That's good right? In my opinion, it is. So the basic rule is that antioxidants help prevent heart disease, cancer and a number of other things. The list goes on, but what I noticed is that there are lots of beans berries and different kinds of apples. So what do we notice? Eating beans, fruits and veggies is healthy! (Just remember o make sure to have organic ones or to pick them wild) Green tea apparently also has a lot of antioxidants, so go ahead and have some of that. In my opinion, one does not need to take any supplements to be sure to get antioxidants, since Mother Nature has made sure we can get enough from what we eat.